"LEED v4 recognizes market leadership and transparency for building materials, and the U.S. Green Building Council applauds manufacturers that utilize important third-party assessments like SM Transparency Reports to help them move further down the path toward disclosure,” said Sarah Buffaloe, LEED Materials and Resources Specialist. The need for this solution became evident when plumbing industry leader, TOTO USA, committed to environmental leadership beyond compliance, was not able to comply with the new LEED v4 disclosure option to provide EPDs for customers to earn the maximum available product credits for purchasing TOTO products. There is no Product Category Rule for toilets (PCR documents define the requirements for EPDs of a certain product category), just as there are no PCRs for hundreds of other types of products used in building and construction, as well as other industries. In response, Sustainable Minds CEO, Terry Swack, a pioneer in customer experience strategy and design, and Joep Meijer, SM’s LCA Technical Expert and co-author of the LEED Material and Resources credit language, launched an intensive R&D process to evaluate current EPDs with the goal of developing an equivalent reporting solution based on a ‘universal PCR.’ A universal PCR can be continually expanded as each new product category comes along, thereby promoting consistency and enabling faster, more cost-effective decisions. The research findings showed that today’s EPDs are generally too long, too technical (including too much detail in LCA results and other environmental information), don’t include enough descriptive product information, and they do not make it easy to compare products from different manufacturers. The conclusion: most EPDs have not been designed to make it easy for an architect, engineer, designer, builder or contractor to make a greener purchase decision. Efficient & effective decision-making. SM Transparency Reports drive purchase decisions by making LCA and environmental performance information easy to understand. It is a strategic marketing and lead generation tool. The ‘universal PCR’ prescribes all the information required in an EPD, organized into three comprehensive and easy to understand pages. Manufacturers can present a product’s functional and environmental performance attributes and make LCA results understandable by describing what they are actually doing to make their products greener, giving the reader visibility into decisions being made across the product’s life cycle. Decision-makers can quickly review and make well-informed greener purchase decisions. They're in the cloud, freely available and in one click, connect buyers and sellers. It’s a win/win solution. Sustainable Minds saw the opportunity for any manufacturer of any size, across the value chain, who has done an LCA or is considering doing LCAs, to get started being transparent in an effective, credible, comparable and affordable way. Also, any LCA service provider can add an SM Transparency Report to their deliverables to further leverage the value of their work. To standardize the attributes of the report, the SM Transparency Report page footer clearly designates the scope of the LCA – cradle to gate, cradle to grave or cradle to gate with options – and the verification level the manufacturer believes their customers require and that fits their budget —self-declared or 3rd party verified. To ensure the credibility of the entire report, it can be certified just like an EPD, or remain self-declared. The market will decide when and for which products the highest levels of verification are required. What makes both SM LCA Software and SM Transparency Reports understandable is Sustainable Minds Single Figure LCA methodology. Using the EPA’s environmental impact method TRACI (Tool for the Reduction and Assessment of Chemical and Other Environmental Impacts), normalization and weighting from NIST, LCI data from ecoinvent, National Renewable Energy Laboratory (NREL) and other similar sources, it simplifies the complexity of LCA by presenting an aggregate environmental impact factor that enables a reader to easily understand where in the product’s life cycle impacts occur and what’s causing them. SM Transparency Reports present full TRACI and/or CML LCA results, as required for an EPD, along with SM2013 Single Figure scores, by life cycle stage, making it possible for non-LCA experts to understand where the greatest impacts are occurring, what’s causing them and what the manufacturer is doing about them. 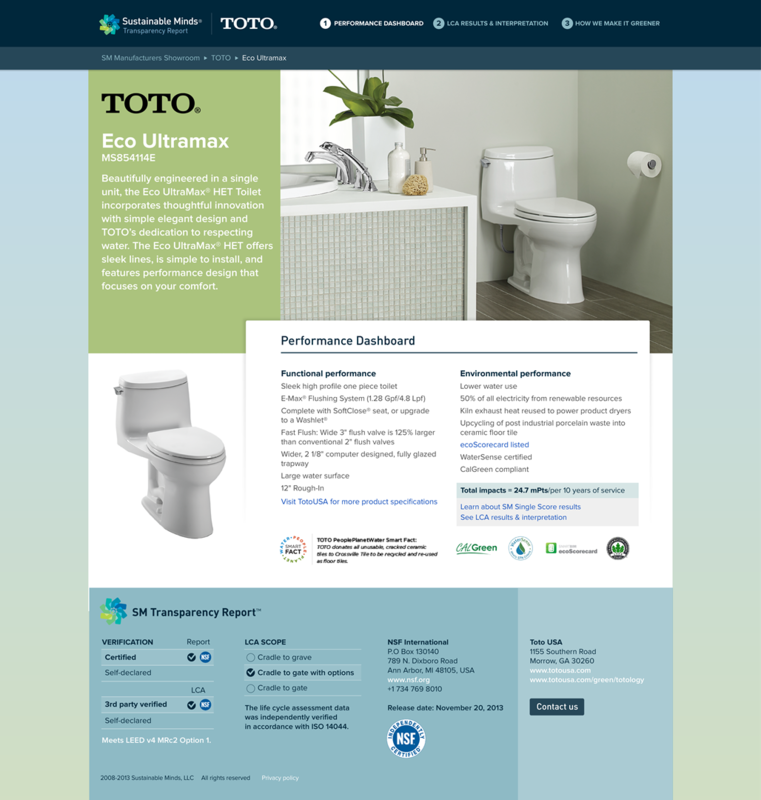 Five SM Transparency Reports for select TOTO toilets can be previewed through the introduction of the SM Manufacturers Showroom (launching in 2014), a public destination for brands, across the value chain, to showcase credibly greener materials, processes, products and their applications. “Regulations and aspirational certifications are driving manufacturers to respond to the transparency demand, but real, understandable information is what builds product and brand preference and ultimately– loyalty. To incentivize manufacturers to invest in LCA, that investment needs to be more highly levereagable. Standardizing the publication, verification and certification process means it can be more effective, rapid, affordable and scalable. This means more credibly greener products will be brought to market. Bill Strang is the best kind of customer who embraces innovation as a component of leadership. It is a privilege to work jointly with TOTO to innovate and address big systemic opportunities.” NSF International was the logical choice to be our first partner as they are an unassailable brand in the product certification space.” – Terry Swack, Founder & CEO, Sustainable Minds. “Integral to TOTO’s ethic of People Planet Water is the journey that we are on to reduce the impact of our products' life cycle, from birth to end of life. For years TOTO has been using life cycle thinking to prioritize where our efforts should be directed to improve our environmental sustainability. We have integrated this into our design, operations and supply chain. With the introduction of LEED v4, we wanted to provide a level of transparency to our customers who are truly engaged in understanding where we are in our journey. However, without a PCR, an EPD was not possible. Working with Sustainable Minds, we determined that a Transparency Report could be developed to address this challenge. We are proud to partner with Sustainable Minds and NSF International to find a solution that is elegant, simple and communicates the message of the journey to our customers.” – Bill Strang, President of Operations – Americas, TOTO USA. NSF Sustainability’s extensive experience in validating and certifying products for the building products industry informs us that innovation is needed to identify, quantify and credibly certify more sustainable products and get that information to the market faster. The Sustainable Minds model provides a platform for doing that.” – Tom Bruursema, General Manager of NSF International’s Sustainability Division. “The most important driver for the USGBC asking for LCA requirements in LEED, was the need for more transparency through quantified environmental performance. LCA puts green ‘attributes’ into a framework that shows actual performance. The LEED v4 credit language is inviting the market to increase the availability of this information, and to recognize industry efforts in getting together to define a harmonized framework. That is exactly what we are doing in an efficient and credible way.” – Joep Meijer, LCA Technical Expert, Sustainable Minds. About Sustainable Minds® Sustainable Minds cloud software and services help product manufacturers, across the value chain, Design & Market greener products.The company is dedicated to operationalizing environmental performance in mainstream product development and manufacturing in an understandable, empowering and credible way. Sustainable Minds life cycle assessment (LCA) software for greener product innovation is used by industry and education in more than 600 locations in 60 countries worldwide. The company's easy-to-use, standardized solutions make it possible for manufacturers, large and small, to dynamically evaluate, compare and improve their products' environmental performance by integrating life cycle thinking and LCA into their product development and marketing processes. Sustainable Minds has been recognized by Gartner® in its 2013 Cool Vendor Report as ‘innovative, impactful and intriguing.’ To learn why, visit www.sustainableminds.com or call 617 401-2269. Follow Sustainable Minds on Twitter @sustainablemnds © 2009-2013, Sustainable Minds and sustainableminds.com are registered trademarks of Sustainable Minds, LLC. About NSF International Founded in 1944, NSF International is a global independent public health and safety organization that writes standards, and tests and certifies products for the food, water and consumer goods industries to minimize adverse health effects and protect the environment (nsf.org). NSF International has been collaborating with the World Health Organization since 1997 in water quality and safety, food safety and indoor environments. NSF Sustainability draws upon this expertise to help companies green their products, operations, systems and supply chains. NSF also founded the National Center for Sustainability Standards, a national initiative to support the development of sustainability standard activities. Additional NSF services include NSF Education and Training, safety audits for the food and water industries, nutritional/dietary supplement certification, organic certification provided by QAI (Quality Assurance International) and management systems registrations delivered through NSF International Strategic Registrations (NSF-ISR). About the U.S. Green Building Council The U.S. Green Building Council (USGBC) is committed to a prosperous and sustainable future through cost-efficient and energy-saving green buildings. USGBC works toward its mission of market transformation through its LEED green building program, robust educational offerings, a nationwide network of chapters and affiliates, the annual Greenbuild International Conference & Expo, the Center for Green Schools and advocacy in support of public policy that encourages and enables green buildings and communities. For more information, visit usgbc.org, explore the Green Building Information Gateway (GBIG) and connect on Twitter and Facebook.